I personally love a good story about humble beginnings and when it comes to Eastside Grammar, humble at best, is how you'd describe these talented working class men. 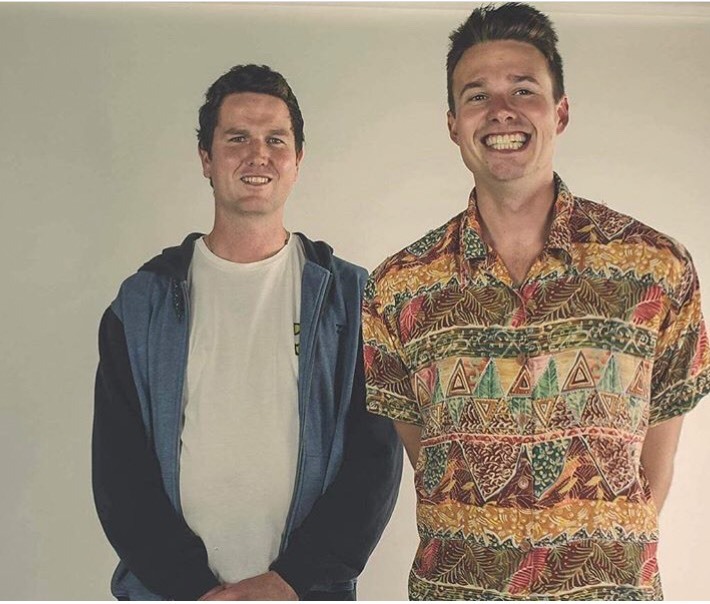 From uni mates in a share-house bickering about the footy, to creative jam session buddies, Michael Crellin & Charlie Raby have come a long way since meeting back in 2015. 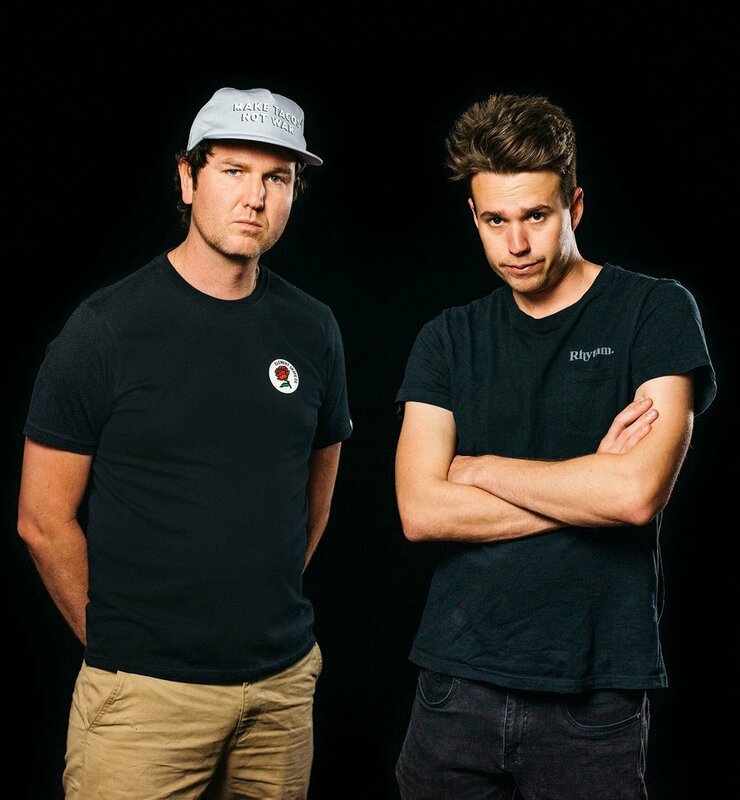 Having reached out to us on Instagram (so millennial - how the tides are shifting), I was lucky enough to have a good ol' chat with Michael (of Eastside Grammar) about how this music venture came to be, what's in store for their epic EP debut, 'Head Cinema', and the reality of self-funded artistry. The truth isn't always glamorous and I love how these guys don't shy away from that. Eastside Grammar, now that is quite a name, how did you guys come up with that? Michael: A long time ago I was living on the north coast whilst studying at University, some friends and I started playing indoor soccer socially and needed a name for our team. One of our mates was from England and suggested ‘Eastside Gama’, as we were living on the east side of town and because according to our mate, 'Gama' was a colloquial term for 'someone with great athletic ability'. I always kept Eastside Grammar in the back of my mind as a potential artist name, as I love the coast and being I’m into words, thoughts, books and writing I thought 'Grammar' was an easy adjustment. What inspired you two to start creating music back in 2015? Cause, I know that you had your own solo project, Platinum Pen, before joining forces with Charlie to create Eastside Grammar. M: Charlie and I met at Uni in class and realised we were playing music with mutual friends. Although we’d see each other at shows and hangout, it wasn’t until we both moved back to Newcastle that we started playing music together. I was still doing a few gigs as Platinum Pen and had asked Charles to do some electric guitar at live shows which we both thought sounded great. The bluesy guitar seemed to compliment the hip-hop sound I had really well and audiences were responding to it. M: We were then living in a share-house together in Merewether and were writing, jamming and conversing about music and creativity a lot of the time. I wanted to break away from doing the solo, rapper venture as I thought it had become such a generic and widespread movement that it was saturated, and I think there is a stigma, or at least an idea associated with rappers, that they’re not musical. Newcastle, for a long time, has been known for being a creative music hub. From pure rock 'n' roll, alternative pop/rock, rap, hip-hop and dance music, there is something for everyone on offer - which makes this city pretty cool. I mean, look no further than Daniel Johns. However, it's no surprise that for artists wanting to establish their sound and themselves in the public arena, it can be pretty daunting and one that comes with its fair share of emotional & financial struggle. Talking with Michael, he expressed how at the centre of it all, it's about making good music that is more about quality than quality - but this comes at a cost & the reality of that is a hard one to ignore. It's pretty awesome to see, that despite financial hardships, '9-5' gigs & other adversities, that these lads are able to come out on top. It's this type of hard-working and dedicated passion that makes this duo a real stand-out. Reigning from this coal city, full of amazing musical talents and artists, how has it been for you, as a band, trying to establish yourselves as serious artists who make legit music? M: We believe we’re still very much in the establishment phase of the process but hitherto the city has been amazing. I mean, we’ve only released three songs and have been a headlining act at two sick events in Secret Garden Sessions and Darby St Live. To be given the respect of not only performing at public events but also being a main act on the bill means a great deal to us considering we haven’t released much product compared to a lot of other artists. M: We’ve got our EP launch show coming up at the Cambridge on the 20/5 which will be the first ever official Eastside Grammar gig and to score the Cambo as the venue is amazing! So, to answer your question in regards to Newcastle, the city has been really supportive of what we’re doing and we have been privy to a lot of privileges that other awesome artists don’t get, so we can only be grateful. However, as far as being taken seriously as an artist in a broader sense, it is challenging when you’re not getting airplay on Triple J. A lot of fans of music in Australia seem to divide creators of original, alternative music into two categories: those who get Triple J play and those who don’t. The former are lionised, receiving idolatry and being associated with creative success, whereas the latter a failure or at least considered struggling. Not getting that attention certainly isn’t ideal but it shouldn’t be perceived as commensurate with a standard for which an artist is struggling to uphold. There are far too many incredible alternative musicians to all get played on one station - it’s impossible to accommodate them all. The language they’re using in their branding probably contributes to these socially constructed ideologies about whose music is ‘legit’ and whose isn’t, for example saying they play ‘the best new music’ and are ‘an authority of new music’, getting played on Triple J should indeed make you more successful but it shouldn’t suddenly make your art better than someone else's. So big ups to all the people out there supporting artists who haven’t got national radio play! What are some of the biggest struggles you face as self-funded artists? M: Unfortunately, our biggest struggle is money. More than ever before, musicians make their money off performances alone and to get to the point where you can make profit off shows, artists need to start reaching and building audiences with online content amongst the more traditional areas of artist marketing like radio play etc . With the enormity of artists on social media, challenging for the consumers attention, you need dope content. We pride ourselves on having top-notch, professional content which obviously can be expensive. M: We’re constantly working to reduce costs on photography and videography content by collaborating with people who are affordable. From my experience of working in the music industry there are a lot of sole traders who are over-charging for their work. For instance, when getting quotes on video clips, there are people charging thousands of dollars who don’t have the experience or the catalogue to justify the price. There are so many musicians who aren’t getting a slice of their own pie, because by the time they’ve paid for photography, videography, online promotion and recording costs they’d need to sell out shows to hundreds of people just to break even, which a lot of artists can’t or won’t do. Although there’s the old adage you’ve got to spend money to make money, I’m also of the opinion the artist should eat first off their art. So, we constantly face the struggle of being vigilant with our costs. You both work regular ‘9-5’ gigs and manage to create music on the side - how do you juggle your music and work life? M: We love making music so the writing and performing parts aren’t seen as extra commitments in our life, I guess, that’s an awesome thing we can do which is always enjoyable, therapeutic, rewarding and celebratory. Charlie works in sales and I’m a high school teacher, so it is hard trying to find time when we’re both available for commitments, as we’re both busy and can have conflicting schedules. I guess when it comes down to collaborating, well it’s about communicating well together and trying to be flexible as possible. The organising side of things becomes frustrating and at times onerous being we’re still running it all ourselves. On a more positive note, what is it you love about creating music? What keeps you coming back? M: Writing music and lyrics is always cathartic and therapeutic. It enables you to comment on the world, it enables you to etch a story in time. I think playing live shows is another big reason why I keep coming back. Oh! Now for a fun question, if you could collaborate with any local artist, who would it be & why? There’s a lot of artists killing it in Newcastle right now. As we've already established, Eastside Grammar are still in the early phase of their music career, where navigating their sound and finding their place is an ongoing process. However, with the release of 'Head Cinema', I think this will see these guys finding their feet. Having only had a sneak peak of what to expect off of 'Head Cinema', with tracks like 'North' & 'Spin City', Eastside Grammar are setting music lovers up for a lot of surprises (good ones - mind you). Their sound reminds me of Australian hip-hop legends Bliss N Esso meets Hilltop Hoods, with some awesome jazzy/blues influences in there to funk it up. These pops of flavour to the hip-hop & blues genre is best seen live and you can, at their really epic launch show at The Cambridge Hotel this Sunday evening (so, get there if you can). With this EP, what can long-time fans and/or newbies expect to hear with this new music? Our EP has five tracks which are all different. You can expect to hear a wide range of songs in a wide range of genres which highlight our interest in telling stories. We’ve done all the music ourselves, with me on the drums, piano and raps and Charlie on the guitars and singing. We get friends to help out with certain things, with Clint Topic playing the bass, Zana Kobayashi doing back up vocals and Hendrik De Vries laying down the viola. They all rip and we’re really proud of what we’ve done. The viola certainly contributes something really unique to the whole project. What are the main themes and topics discussed on this EP? The Head Cinema concept came about when we met some Germans a few years ago. They used the term 'Head Cinema' to describe when one’s thoughts run away with themselves. There’s a lot of narratives on the EP, which are centred around lust, romance, heart-ache, nostalgia, love, ambition - amongst a whole lot of other emotions and themes. Why was it important that you had these particular themes and issues ‘discussed’ on this EP? We just wanted to paint a picture of our lives and share it with the world. Is there something you would like people to take away from this EP? What they take away from it is up to them. Hopefully it helps people, for example, if they need inspiration or an escape and if this perpetuates that, then awesome. Last, but definitely not least, other than the release of this EP (which I’m sure will be awesome), what is next on the cards for Eastside Grammar? Launch show at the Cambridge Hotel this Sunday the 20.5 with Talakai, Morgana Osaki, Polar Chills and Soar. Doors open at 8. Releasing the EP next weekend, then hopefully playing some more shows, maybe a tour and release more music that we’ve been working on. Be sure to check out Eastside Grammar at The Cambridge Hotel this Sunday night for the launch of their debut EP 'Head Cinema' - plus, they have an awesome support crew too - Talakai, Morgana Osaki , Soar & Polar Chills - don't miss it.